‘Fruit Guys’ deliver the freshest, export quality, delicious fruit direct to your doorstep. Fruit Guys is the farmers market that delivers. You can now order the freshest fruit, award winning coffee and pure New Zealand juices directly to your door. Fruit Guys have been keeping the workers of New Zealand healthy and energized with our workplace fruit deliveries since 2008. Now it’s time to look after you too. Simply add the products to your cart and go through to the check out. Before you know it, you will be enjoying the very best of the farmers market. Our aim is to make your life easier, healthier and certainly tastier. Whether it’s the freshest fruit, award winning coffees or pure New Zealand juices, you won’t be disappointed with the quality of your Fruit Guys delivery. Simply order on line and your box will be delivered on schedule with a smile. Start planning what you will do with all that spare time! Set up your account to show your likes and dislikes and we will make sure your chosen fruit box will be full of the delicious fresh fruits and vegetables that you and your family love. Marry your fruit box with coffee and juice if you so desire. If you love your Fruit Guys box and you want to organise a regular delivery, that’s great. Just tick the box when you register and we will schedule your deliveries as per your instructions. If you want to put these on hold, cancel or change the order, that’s easy, just log in to your account and make the changes, or call us. We will make sure that you get the best mix of fruit available. Our aim is to increase your intake of fresh produce by giving you an interesting mix each week. Value Our prices all include GST and there is no charge for delivery (over $30.00). We run a lean ship so that we can keep our prices low and great value. Fruit Guys operate a fully audited food safety program and all of our growers are approved suppliers under our FSP. This means that the produce you receive from us is safe to eat and you can eat it with the knowledge it has been grown, handled and packed in accordance with our strict safety guidelines. No more will you be buying fruit that has potentially been handled many times by the unwashed public while on display. Our stylish boxes are made from mostly recycled paper. While these are in good, clean condition we will re-use them. Please leave your box out for our driver to collect when he drops off your next full one. It’s a good idea to leave the empty box where you would like us to leave your next full one. Whenever possible we buy locally grown produce. However we do recognise that New Zealand has a limited growing season for many products or just isn’t warm enough for others, so from time to time we will include imported produce. After all why should we totally miss out on bananas, mangoes, papaya and pineapples. Our boxes will be delivered during the afternoon, Tuesday to Friday. If you have specific delivery instructions please note them in the available box when you register online. Orders received by 7am will be delivered the following day. i.e. order by 7am Monday for Tuesday delivery. Order by 7am Tuesday for Wednesday delivery. This allows us enough time organise your fresh goodies for delivery. When there is a public holiday we will deliver the following day. 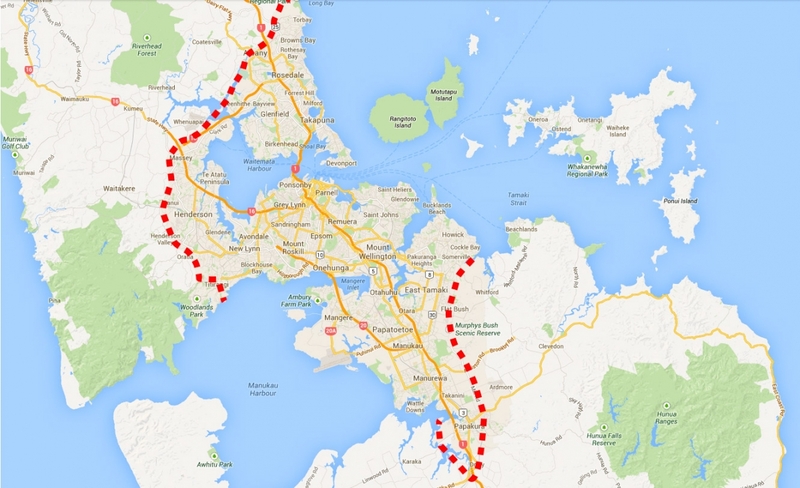 We deliver Auckland wide Tuesday to Friday, see the map below for the limits of our deliveries.